Singapore Finance Minister Heng Swee Keat just announced the government’s mid-term review of the Research, Innovation, and Enterprise (RIE) 2020 plan for science and technology. S$144 million will be designated to the Singapore Food Story R&D Programme, which includes research for cell-based meat. Minister Heng noted that the RIE research priorities were selected to ensure Singapore's long term competitiveness. Cell therapy, cybersecurity, and other digital technologies are on the list alongside the future of food. Singapore has become a global leader in cell-based meat development. Clean meat startup Shiok Meats, co-founded by Sandhya Sriram and Ka Yi Ling, is currently developing cell-based seafood. And the government’s Agency for Science and Technology Research (A*STAR) is in the early stages of developing clean meat technology itself, with the goal of beginning work on poultry meat by the end of 2019. While relatively limited in natural resources, Singapore is an early mover in technology. Singapore currently imports 90 percent of its food. The government recently announced a goal of raising domestic food production from 10 percent to 30 percent by 2030. If the RIE 2020 plan is any indication, Singapore sees cell-based meat production as a promising technology for meeting the “30 by 30” goal. Update: Shiok Meats debuted clean shrimp on March 29, 2019. Elaine Siu, GFI Managing Director of Asia Pacific, was one of three tasters at the world debut press conference for their shrimp dumplings at the Disruption of Food and Sustainability Summit in Singapore. 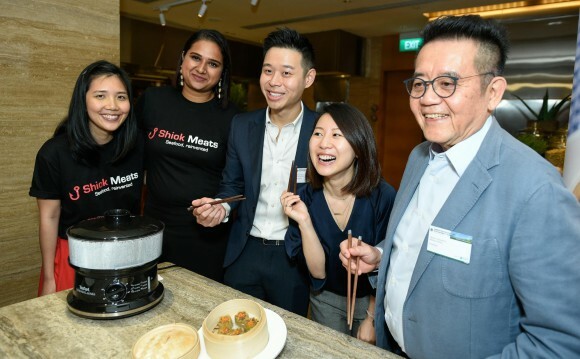 (Left to right) Ka Yi Ling and Sandhya Sriram, co-founders of Shiok Meats; John Cheng, Director at Innovate 360, the food startup incubator arm of Singapore’s oldest rock sugar manufacturer Cheng Yee Heng; Elaine Siu; and Henry Soesanto, CEO of Monde Nissin.